Poland. 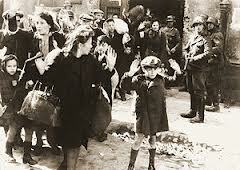 Warsaw Ghetto Uprising, 70 years later. “The Polish capital of Warsaw marked the 70th anniversary of the Warsaw Ghetto Uprising of 1943, when hundreds of young, poorly armed Jews staged an ultimately doomed revolt against the Nazis. Poland was once a Jewish bastion in Europe, 90% of the country’s 3.3 million pre-war Jewish residents were dead by 1945. One synagogue remains in Warsaw, but it is tucked discreetly away among the skyscrapers and apartment buildings of the capital’s downtown area. To honour the occasion of the 70th anniversary of the uprising, the Museum of the History of Polish Jews is now open. The museum is funded by the Polish state, the city of Warsaw, and several private donors. The Warsaw Ghetto was the biggest of all of Nazi-occupied Europe’s Jewish Ghettos during World War II, but Germans razed the neighbourhood and the post-war communist regime later built houses directly over the rubble. Three small fragments of the ghetto’s wall survived”. Article – France 24 – April 2013.